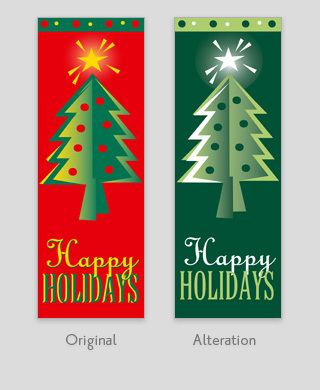 We love our stock banners but we also know that they may not always meet the requirements needed for specific projects. And that's okay, we're always ready to make art alterations to our designs, produce them at different sizes, print them on alternate fabric styles, or create custom banner designs to meet a wide variety of needs/specifications. 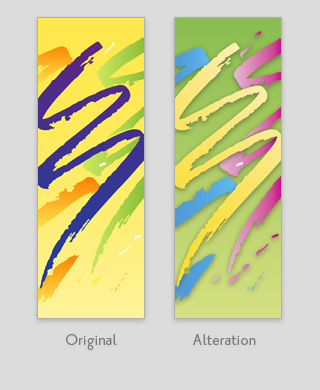 Do you have custom banner art designed by in-house staff or another agency/third party? That's okay too! We produce that type work everyday at Banner Up!™ for local, regional, national, and international customers. Image Position, Rotation, Size, and Cropping. Every major art element is open to these ideas although there may be some limitations to what we can do with stock designs that are photography based. 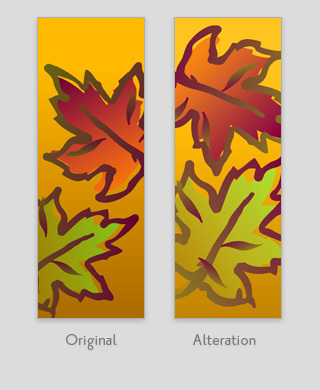 • Example A → Move, rotate, and resize Autumn Leaves. • Example B → Enlarge Christmas Tree, move text. 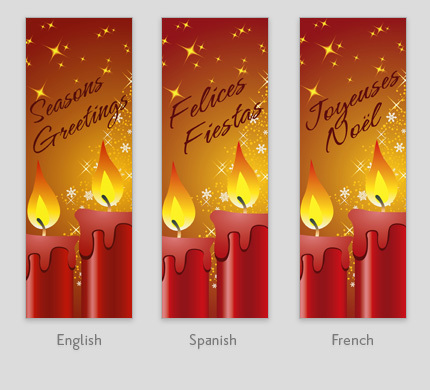 Change Color of Art Elements and Backgrounds. 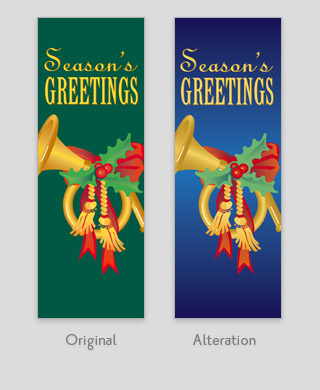 These alterations can be applied to any of our vinyl banner designs. Changing the background color for our marine acrylic stock designs is achieved through printing on a different fabric color; art elements are changeable for those designs. 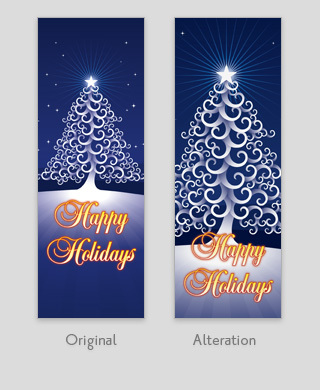 • Example C → Change background color on vinyl banner. • Example D → Change all colors on vinyl banner. • Example E → Change ink and fabric colors on marine acrylic banner. Changing text color is the simple idea here. The big idea is replacing the standard text with a new message or switching our English phrase to an equivalent French, Spanish, or other language of your choice. • Example F → English, Spanish, and French text variants. Mix and Match Stock Designs. Is your committee indecisive over which of our stock designs to choose for your project? We can help you push them along by creating hybrid art from two or more of our stock designs; sort of a combo plate à la carte special! • Example G → Hybrid art from two banner designs. Our screen print marine acrylic banners are produced on the exact same fabrics that are used for awnings and outdoor furniture. Inks are outdoor rated plastisol colors. This combination of raw goods assures a long life for your project! 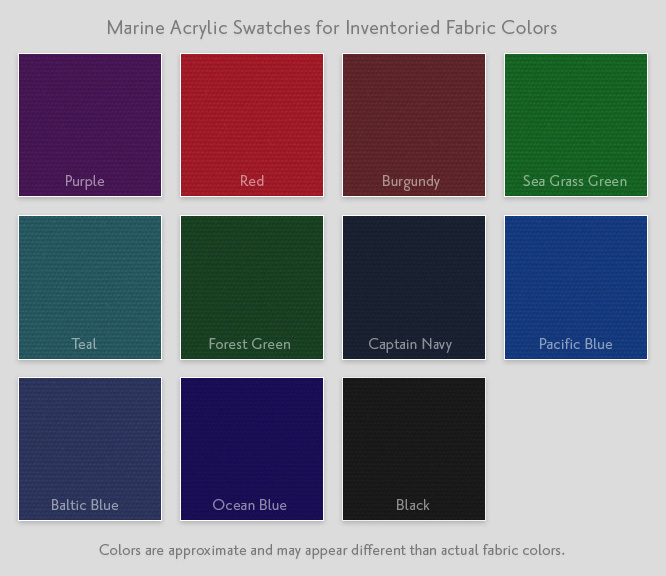 • Marine acrylic fabric swatches. Our digital print 18 oz. vinyl is custom-formulated with a unique twisted scrim that provides superior strength against the harshest of elements. Inks are outdoor rated solvent and UV based systems. In addition to the materials noted above we can also digitally print on several other fabric types that are suitable for outdoor and interior uses. Outdoor options utilize all types of vinyl and fabrics from lightweight flag material to heavy weight vinyl and canvas. Interior options include a wide array of threaded and manufactured fabrics; poplin, satin, oxford, smooth surface vinyl, photo paper, opaque and translucent plastics, and much more! 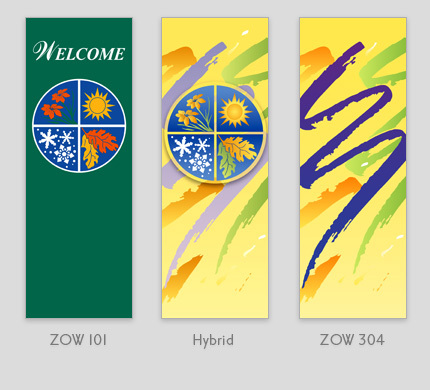 Whether you need one or one-thousand banners, Banner Up!™ is your one stop production source. Our customer base includes civic organizations, universities, seasonal/holiday decorators, small towns, large cities, corporate entities, shopping centers, property managers, and more. Over the years we've had the privilege to produce light pole and event banners for The Super Bowl, The Rolling Stones, the Pope's visit to the United States, The Olympics, Olympic Festivals, Saint Louis Cardinals Baseball, Saint Louis Blues Hockey, Saint Louis Rams Football, and many others!